Learn how to really make a difference with your patients by mastering the art and science of working with the breath. Breathing is fundamental to optimal health and physical function. 1 in 10 people have dysfunctional breathing yet it is often overlooked. Many difficult to treat patients, unresponsive to standard treatment can improve when their breathing issues are addressed. Breathing based therapies can help patients with many different types of conditions and enhance the effects of other therapeutic approaches. Module 1 covers the neuromuscular/biomechanical. Module 2 covers the biochemical and the psychophysiological. This course is for practitioners who recognise the need to assess and optimise airway function and breathing in their patients and want to acquire the knowledge and skills needed to do this effectively. You may take either or both modules. Scroll down for course dates and details. 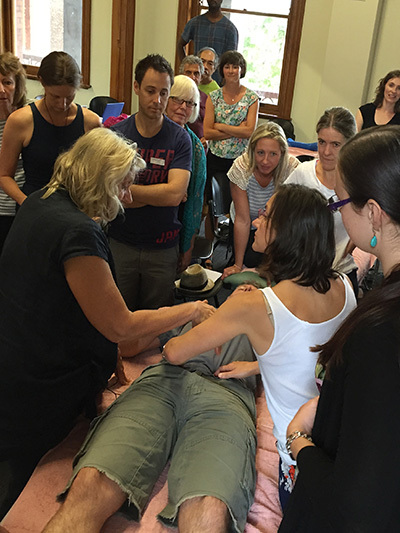 The course is a synthesis of Dr. Courtney’s many years of academic research and her broad clinical practical experience as an osteopath, breathing therapist and practitioner of integrative health. Rosalba is a world leader in this field and has published several text book chapters and many journal articles on this topic. She is one of the few people in the world to complete a PhD research on the topic of breathing therapy and dysfunctional breathing. Much of the material presented in this course is unavailable elsewhere. Modules 1 and 2 of this course will give you the fundamental knowledge and skills needed to apply Dr Courtney’s multi-dimensional model of dysfunctional breathing to breathing assessment and therapy for a broad range of patients and conditions. Learn to recognise, measure and treat biomechanical, biochemical and psychophysiological aspect of dysfunctional breathing using evidence based tools. 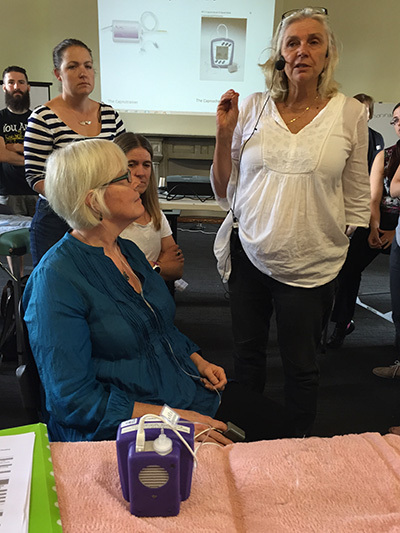 Learn how to choose from a range of evidenced based breathing therapies and combine them with your other clinical skills to enhance patient care. 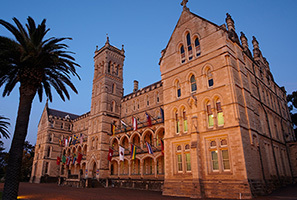 The course will give participants hands-on and practical training in the use of a number of evidence based assessment tools developed by Dr Courtney such as the Self-Evaluation of Breathing Questionnaire (SEBQ), the Manual Assessment of Respiratory Motion (MARM) and other validated and evidence based assessment tools and protocols. Breathing dysfunction can be caused by structural-anatomical factors, various disease processes or psychological factors. Optimal outcomes for breathing therapy depend on understanding how to address causal factors and work with other health professionals. Neuromuscular and Biomechanical Dimension – This module provides you with the knowledge and skills needed to assess and treat the biomechanical and neuromuscular aspects of breathing dysfunction, including breathing pattern disorders, mouth breathing, and diaphragm dysfunction. You will learn how breathing impacts on muscular skeletal function and the function of the respiratory, cardiovascular, lymphatic, digestive and autonomic nervous system. You will gain skills to apply breathing therapy and breathing retraining as part of a multi-disciplinary approach to a broad range of conditions. Describe key characteristics of functional and dysfunctional breathing. 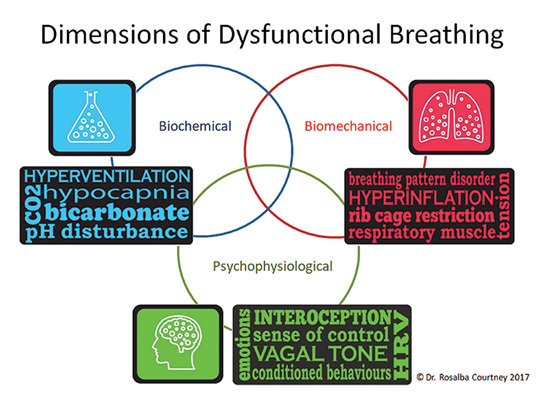 Recognise key features of functional and dysfunctional breathing behaviours and patterns. Describe links between breathing and posture, spinal stability and motor control. Understand the multiple (sensory, motor, respiratory and non-respiratory) functions of the diaphragm and other respiratory muscles. Understand the impact of breathing dysfunction in patients with chronic and treatment resistant back, neck, pelvic, TMJ pain shoulder pain and thoracic inlet syndromes. Understand the links between breathing dysfunction and speech/vocalisation disorders, oral-myofunctional disorders, sleep-breathing disorders, gastro-intestinal disorders, cardiovascular and respiratory disease and athletic performance. Evaluate dysfunctional breathing symptoms with validated questionnaires e.g. Nijmegen Questionnaire and the Self Evaluation of Breathing Questionnaire. Evaluate and interpret postural and muscular-skeletal signs of dysfunctional breathing. Perform the Manual Assessment of Respiratory Motion (MARM) and Hi Lo breathing assessment and record findings using graphic and numerical notations. Apply a range of techniques to improve diaphragm strength, position and function. Teach basic and advanced versions of “Breathing Basics Protocol” for retraining posture and motor control of breathing. Recognise key signs of upper air way insufficiency and dysfunction. 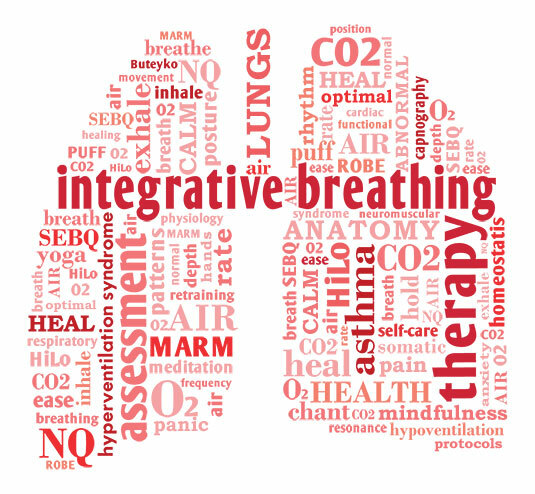 Integrate breathing retraining into multi-disciplinary treatment for mouth breathing. Learn techniques to correct mouth breathing and rehabilitate nasal function in adults and children. Understand how breathing modulation can be used to influence and optimise pressure, circulation and fluid dynamics in the cardiovascular, lymphatic and cerebro-spinal systems. Module 2 focuses on the physiology, assessment and treatment of the biochemical and psychophysiological dimensions of breathing. Biochemical Dimension – You will learn to assess and treat the biochemical dimension of breathing. You will also learn how to treat breathing dysfunctions such as hyperventilation and hypoventilation disorders and apply some breathing therapies that either raise or lower oxygen and carbon dioxide levels for therapeutic purposes e.g capnometry assisted biofeedback, the Buteyko method, Intermittent Hypoxic Training and therapeutic hyperventilation techniques. Psychophysiolgical Dimension – You will learn the key concepts of respiratory psychophysiology including the relationships between breathing, mental and emotional processes and the stress response. You will learn breathing techniques that improve the function and regulation of the autonomic nervous system, reduce hyperarousal and reset the reactivity of the stress response. You will also learn how to include appropriate breathing therapies as part of a multi-disciplinary approach to assist patients with anxiety, trauma, depression and stress related disorders. Understand the biochemical aspects of breathing physiology and its relation to the multi-dimensional model of dysfunctional breathing. Identify key breathing therapies that affect the biochemical dimension and be aware of research in this field. Understand the physiology of gas exchange and role of oxygen, CO2 and pH in the regulation of breathing and health. Understand how to asses and treat hyperventilation disorders. Learn and practice techniques that address hyperventilation disorders e.g. capnometry assisted biofeedback, mindful breath and movement and the Buteyko method. Understand the principles of adaptive medicine and hormesis. Learn and practice breathing techniques that stimulate healing through hormesis and adaptation e.g. Intermittent Hypoxic Training, hypoventilation and hyperventilation therapies. . Understand the fundamentals of respiratory psychophysiology and interactions between the mind, emotions and breathing. Be aware of key breathing therapies that work on the psychophysiological dimension and the research on these therapies. Understand breathing-brain, autonomic nervous system interactions and the psychophysiology of breathing in hyperarousal, allostatic load and the stress response. Understand how psychological issues affect breathing perception, regulation and control. Learn and apply techniques of resonance frequency breathing and mindful breath and movement practices. Understand how to integrative breathing retraining in the multi-disciplinary care of patients with burnout, anxiety, depression, panic disorder, PTSD and chronic pain.